comfortable taking photos in crowded places because then it is harder or even impossible to catch this intimate feeling I am always seeking for. It is essential for me to capture these little, unique moments of one’s movement and body language, so it takes a lot of concentration and attention. A little distraction can easily take my inspiration and certain mood away. Is there a certain style you try to achieve? There isn’t a certain style I try to achieve. I believe the most interesting and self exploring part is when one’s photography is changing over the time. Mine is certainly changing due to my little experience, besides I am still searching myself in this field. What I try to perceive are these genuine emotions, in addition it is what I value the most when looking at works of other photographers. What motivates you to keep creating? Actually, sometimes I don’t know. I have experienced so many moments when I am constantly disappointed in my own work that sometimes I feel surprised where I get this motivation of still keeping doing what I do. I guess it is the best way I can express myself and we, human beings, have this unconscious need to keep expressing ourselves. I am inspired by emotions, experiences, music, movies, books, people, nature and seasons. Do you prefer using digital or film? Why? I definitely prefer film. It gives a completely different taste to the action and outcome as well. I enjoy having only 36 or even less to capture the most special moments. I am so excited every time I go to the store after another developed film; it’s like a little celebration. However, I use digital as well. Shooting with film is quite an expensive pleasure. Therefore I appreciate having a digital camera too. How would you describe the word silence? How do you think this can be expressed through photos? Silence is something pure and genuine. It is hard to describe silence, but it reminds me of those moments when it feels like the time has stopped. I experience these moments every time I capture emotions in pictures. Silence in photos can be expressed through body language, colors, setting and with help of many, many other aspects. However, almost anything can be interpreted as silence. I guess we always find in pictures and art in general what we need and what we are looking for and it does not matter whether it is silence, noise chaos or calmness. Silence is something pure and genuine. LOST FREEDOM: Tell us a little about yourself. How old are you and where are you from? AMANDA BROWN: I feel like my work says the most about me, but the stats are that I am a 26 year old New Yorker by way of Wisconsin. I have my BFA in printmaking and painting and I’m currently studying at Hunter College here in NYC. I live in East Harlem with my amazing boyfriend Matt and our pit bull pup Molly. When did you first become interested in art? How has your work changed since then? We’ll have to go way back for that. In pre-school I would talk my teachers out of nap time so we could write stories for me to illustrate. There were mermaids who I forgot to give arms, families of dinosaurs and hot pink unicorns with a rainbow for a mane. I have been very lucky in my life to be surrounded by people who supported my passion and saw my art as something with real importance and not simply a hobby I would grow out of. Since my armless mermaid days and now, a lot has changed and a lot has stayed the same. I still have an intense love of color and I still create with the same ferocity of a child with a new box of Crayola 64s. Today, I like to think I chose my colors more thoughtful but I know deep down I’m following the kid inside me. Being inspired by the natural world around me, even though it’s not dinosaur families, is still quite fantastical. I also have a lot more patience with my art now, which allows me to look deeper than I was capable of before and really work to get to the core of what I am making. Is there a certain mood or message you try to achieve in your artwork? I’m looking to create a sense of wonder and remembrance. I want someone to look at one of my paintings and say “I see the milky way galaxy and my own twisting DNA.” The macro and micro reflect each other, and we are caught in between unable to see either with the naked-eye. I want to facilitate the viewer in seeing that connection, to be the microscope and the telescope, so they can see that it is beautiful. What is your favorite medium to use? Why? I love working with watercolors because it almost has a mind of its own. You can put the paint wherever you want it but I allow it to seep into the next color, to splash from the brush or sink into a groove on the paper. I then go in and try to bring control to the chaos but the random is part of the beauty. Who or what inspires you? The most random things will inspire me. Sometimes its the pattern of a dress I see a girl wearing on the subway, or a flower in the most shocking purple color. Mostly I draw inspiration from my time in the outdoors. I’m an avid fan of Mother Nature, who is the greatest artist I’ve every seen. In truth, I’m just a terrible copycat of her best works. I want someone to look at one of my paintings and say “I see the milky way galaxy and my own twisting DNA.” I’m also moved by the people I know who go out there confidently chasing their dreams. Watching their growing success and happiness, inspires me to stay true to myself, my dreams and my aesthetic. It’s powerful to see that there is still a place for passionate, authentic people in this world. How would you define the word silence? What does this mean to you? Silence is a calming absence. Whether it be of noise, or movement, or pain, silence gives solace. To me that means a time to look beyond myself at the greater picture. True silence is a rarity, because we all have the sound of blood pumping in our ears. LOST FREEDOM: Tell us a little about yourself. How did you first become interested in photography? HANNAH DAVIS: I’m nineteen years old and I first started seriously getting into photography when I was about 16. Some of my friends were taking an interest in it at the time and I thought it looked like fun, so I started taking silly little self portraits with a point and shoot and editing them with Photoshop. Eventually I saved up to buy a DSLR and I was hooked from then on out. I didn’t expect it to stick and become such a strong passion of mine, but I’m very grateful it did. Personally, do you think photography is more of a way to document memories or to express emotions? I think it can depend on what kind of photographer you want to be. I choose to mainly create a moment to express emotions but I know of some wonderful photographs that are purely documentation. Personally, I’m really interested in blurring the lines between the two. I want to document something that will make you feel, and create moments that feel like your own memories. Do you prefer shooting portraits or landscapes? Why? I prefer portraits because I want as much emotion in my photographs as possible. I want to make you feel, and I think the best way to do that is with people. There is only so much I can get out of a beautiful landscape, but there is an endless amount of emotion from people. It’s also much more of a challenge, I think. Landscapes will stay still and perfect for you, but people can’t. It’s fun getting that one perfect shot; you feel like you earned it a little more. Is there a certain mood you want to achieve in your photos? Any and all of them. I do feel like I’m swayed more towards loneliness and something a bit more quiet and ethereal. I just like to express what I’ve got in me. What motivates you to continue to create? What doesn’t? I’m completely hooked. The internet does play a large part in it. That drive to impress and keep a constant flow of work up definitely gives me a lot of motivation. I also think the constant want to better my photos keeps me dong it so often. I’m always trying to do something new and achieve better results than the last time. How would you define silence? How do you think this idea is expressed through your photographs? Silence can be quiet, still and often really lonely and I think that shows through a lot in my photos. I spend so much time alone that most of my photos can’t help but show that. I like to show a really peaceful and simple scene, and I like my colours pretty muted, which I think helps make it a quiet photograph. LOST FREEDOM: Tell us a little about yourself. How old are you and where are you from? TINA SOSNA: My name is Tina Sosna and I am 19 years old. I am living in an area called “the green heart of Germany“ so of course I love being surrounded by the forest. When did you first become interested in photography? How has your work changed since then? I first came in touch with photography when I bought my first little compact camera. At the beginning I started to take photos of everything I saw especially I liked to catch the little details that are living in everything.I also wrote many stories and poems, but I never wanted to show them someone. I didn’t found the right or enough words to cover all the feelings and emotions that are in my heart and head. So I tried to express all my thoughts through pictures. My work changed when I met my love who write his own songs. I wanted to bring all these new experiences into my photos. So I started to take analogue pictures. This is in my opinion the perfect way to show all things in my live that I want to show. How would you describe your style? Warm, soft, inspired by nature, tender and expressive. I like to bring these characteristics into my pictures but I also love how analogues photos have kind of like their own life. How do you think location has an impact on your work? Actually the location is the first thing that inspires me to think about what could happen there. Escpecially when warm light shines through the trees or the nature looks like sprung from a fairy tale it seems like the forest lives. This is what makes the photo the story I want to tell. for me silence means being alone in a deserted place where you can be lost in your thoughts and feelings, and without saying anything, time stands still. Who and what inspires you? Beside the woods also music has a very huge influence on my work. But also do movies and books inspires me. This all flows into my feelings that I show in my pictures. How would you define silence? How do you think this idea is shown through your photos? Silence can be defined in very different ways, but for me it means being alone in a deserted place where you can be lost in your thoughts and feelings, and without saying anything, time stands still. I always try to express this particular silence in my photos. Persons look away from the camera so they aren’t bothered or forced to anything. They ought to be free to think whatever they like and to stand there as the human they are with their eyes closed or fixed on something. LOST FREEDOM: Tell us a little about yourself. How old are you and where are you from? MILD CHAWALITANON: My name is Mild and I’m a 15 years old aspiring / self taught photographer from Bangkok who’s currently living in the Philippines. I started photography back in Summer 2011 and been practicing up until now. Photographing makes me feel alive and happy and this is what I love to do. How has photography impacted your life? Photography really has impact my life in many different way. It changes my personality from being such a awkward and quite into an out going person. I used to be so scared to ask an upper class girls from my school. Photography gives me more goals in life, everyday I feel like photographing is really important and I have to photograph something even if it’s a building or the sky as if it’s a kind of drug or something that’s very important to me. How would you define the word silence and how do you think this can be expressed through art? The word silence to me could be calm, quite, peaceful, or not so peaceful. I personally like to express the word silence through facial expression or the word silence itself. Most black and white photograph can really express the word silence, most of my landscape photograph are black and white to show the calmness and silence within it. Photography makes me feel alive and happy. I’ve wanted to create something hopefully beautiful. Something that remains. vital and magical in itself. I think they dominate my style. Iâ&#x20AC;&#x2122;d love to do fashion shoots later! Is there a certain mood your try to express through your work? Freedom, happiness and strength. I want that the people never give up on their dream and that they fight for what they dream for. Who and what inspires you? There are many beautiful photographers in this world who inspire me. But not only photography inspire me. Also poetry, sayings, lyrics and my own experience with people. How would you define the word silence and what does it mean to you? For me silence has two meanings. It can be so terrible when you feel lonely and useless and you think almost everybody hates you. Then you often listen to music right? Because then you hate silence and it kills you. But sometimes you need silence to have time for yourself and think of everything. http://www.flickr.com/63328068@N04/ LOST FREEDOM: Tell us a little about yourself. How old are you and where are you from? MARIA SCHELERLIES: Iâ&#x20AC;&#x2122;m Maria Scherlies, a 19-year old girl from Berlin, Germany. When did you first begin taking photos? How has your work changed since then? I started taking photos at the age of 14. I took a lot of self-portraits for fun. But even then I was really interested in the editing of my photos. I experimented a lot. After I did an industrial placement at a photographerâ&#x20AC;&#x2122;s studio, I decided to buy me a DSLR. I took photos of everything at any time. Then I specialised in nature photography but I got bored of it and so I started with portrait photography a year ago. My work has improved but I still get better with every shooting. How would you define the word silence? In this loud and crowded world, I think, silence is really precious. Silence is when you can get lost in your daydreams and thoughts without any interruption of others. http://facebook.com/beatapietrasphotography LOST FREEDOM: Tell us a little about yourself. How old are you and where are you from? BEATA PIETRAS: My name is Beata Pietras. I am 28 years old and come from Poland but living in Ireland for the past 5 years. How did you first become interested in photography? How has your style developed since then? I started becoming really interested in photography when I bought my first mobile phone with a camera. I was taking self portraits mostly and enjoyed the editing process. It quickly became an obssesion and I decided to purchase my first dslr. Since then Iâ&#x20AC;&#x2122;ve gained a lot of knowledge about photography/post processing. I have also found that the more I learn the more hungry I am and determined I am to further my knowledge. I work very hard and have came to the realisation that the harder I work the more I learn, and you can never learn too much. Do you often plan your shoots beforehand? How do you think your final photos show what you original wanted to express? I think when it comes to photography planned photoshoots always end in best results. I like to spend as much time as needed on each individual image because of my attention to detail. How does fashion play a role in your work? I get constant inspiration from fashion. In the future I hope to work with some creative designers and stylists. 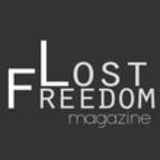 http://jane-beata.deviantart.com LOST FREEDOM: Tell us a little about yourself. How old are you and where are you from? JANE BEATA: I am 28 years old and I’m from Slovakia, although I live and work in Prague, Czech Republic. When did you first become interested in art? How has your work changed since then? I was interested in arts of many kind since I was a child, not exclusively visual arts, my passion was also poetry and theatre. It has a lot to do with my family and the way I was raised that made me incline towards this direction. Yet, I went to study natural sciences and only after my daughter was born, art has pulled me back under its wings. My work and my whole perceptive of art has changed dramatically and it keeps on developing. What is your favorite medium to use? Why? I love fluid media such as watercolor, ink or gouache with passion. The reason is somewhere close to the fact that I’ve been paying the most attention to learn these media and haven’t discovered or fully experimented with other yet, but I also just love the spontaneous effects and it’s airiness. Who or what inspires you? My own feelings, music, colors and other artists. I react very strongly to colors and I’m trying to speak through them more than through lines. And of course people, they are my object of interest no.1. Silence isn’t an acoustic vacuum, it’s a disconnection, a lack of will to communicate. Is there a certain mood or message you try to achieve in your artwork? Yes and no. Sometimes I experiment with the design of portraits, trying to make them stimulate certain emotion more or less. It seems like shifts on the surface that go from what color to chose to the face expression, but it’s these “superficial” signs that make viewers relate to the artwork emotionally. No matter what specific thought I have on my mind when painting, the artwork than talks to people in its own language, making them find what THEY have in mind. How would you define the word silence? What does this mean to you? To me, silence isn’t an acoustic vacuum, it’s a disconnection, a lack of will to communicate. Communication is healthy and crucial for survival, silence on the other hand might be harmful. silence is a friend that doesnâ&#x20AC;&#x2122;t demand. we meet daily, not by chance, but by necessity. she follows me in the waking hours, before the day begins, accompanies me in the sleepiest times, and the times when i need less noise, less interaction. she gives me space.